I’m really excited to share yesterday’s eats with you, because there’s a great example of what it means to really listen to your body when making food choices. I almost forgot to snap a photo of yesterday’s breakfast, so here’s a shot of just the last couple of bites. 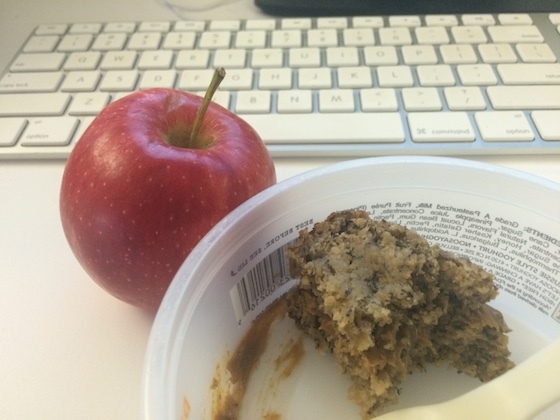 I enjoyed some banana bread with sunflower seed butter, plus a yummy gala apple. The banana bread is a new recipe that only has a few ingredients: mostly oats and ripe bananas! It was incredibly moist and just-sweet-enough. 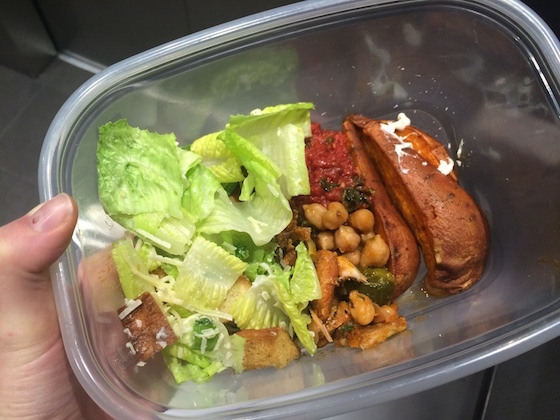 I also ate lunch at the office: a few pieces of sweet potato, some caesar salad, a bit of chicken with garbanzo beans, and some more veggies. It was a pretty strange assortment, but it tasted good. The salad in particular really hit the spot! The veggies you see in this picture are a mix of a baked sweet potato and some roasted green beans, broccoli, and peas. They were left over from earlier in the week, and I brought them to work yesterday, intended for my afternoon snack. However, as the day wore on, I never really got hungry. So, I simply listened to my body, and brought them straight back home. For dinner, I heated them up along with some scrambled eggs. In the eggs, I added some goat cheese and a spoonful of a delicious tomato jam that my mom made me. I also included an enormous green salad on the side (it was A LOT bigger than it looks here). 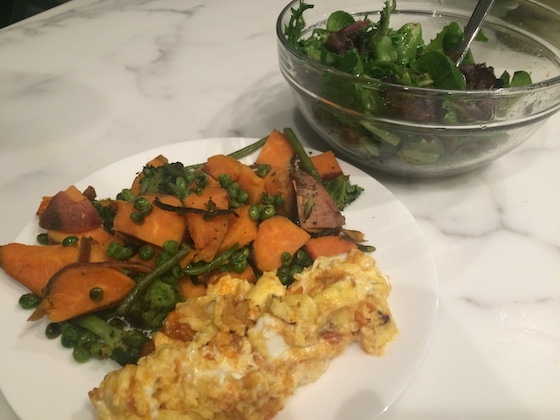 As I was eating dinner, I had another opportunity to practice intuitive eating. Everything tasted so yummy, but part of the way through my plate I started to get full – probably because of the high volume of veggies. The eggs were my favorite part, so I finished them up. I packed about half of the roasted veggies to enjoy later – leftovers again! By not forcing myself to finish my plate, I ended the night feeling satisfied and light rather than stuffed and uncomfortable.